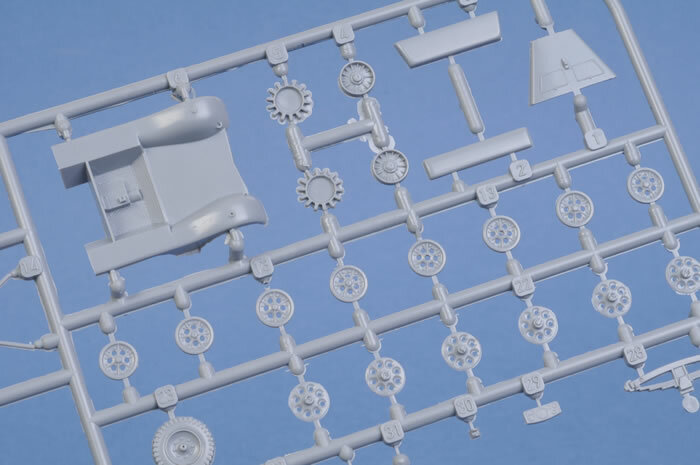 Media and Contents: 126 mid-grey plastic parts on two sprues, 35 PE parts on one fret, 2 black rubber band track lengths and one piece of clear acetate for windows and instrument panel. A 3 page A5 sized instruction booklet with history, parts plan, 16 build diagrams and one page of paint/decal instructions. 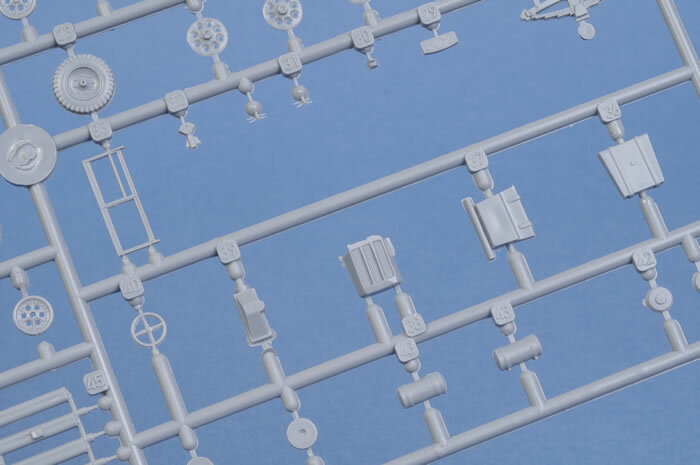 Advantages: The third Sd.Kfz.11 from Special Armour, the main sprue is from the original with a different second sprue to individualize each. Highly detailed. Disadvantages: Mould halves are misaligned requiring extra clean-up, lots of flash and an odd way of attaching the outside road wheels which I feel sure will cause problems later. Not for the inexperienced. Conclusion: The only other Sd.Kfz.11 kits in small scale are the Italeri (ex-Esci) in 1/72 scale and the Matchbox kit in 1/76. 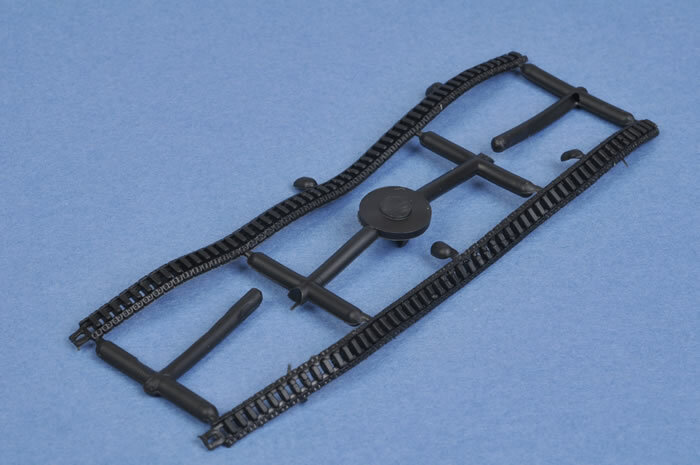 This kit is better than both in shape and detail but is let down by moulding that is not up to the standard we've come to expect from MPM and rubber band tracks. However, with that extra bit of work required for a short-run kit this could still end up a showstopper. The 3 ton Sd.Kfz.11 was designed for the German Army before WW II and used in every theatre until the end. Although built for many special purposes including smoke generation and decontamination, it was mainly used as a gun tractor and general transport. The same chassis, engine and running gear was the basis of the very successful 251 APC. This is the third Sd.Kfz.11 produced under the Special Armour label. 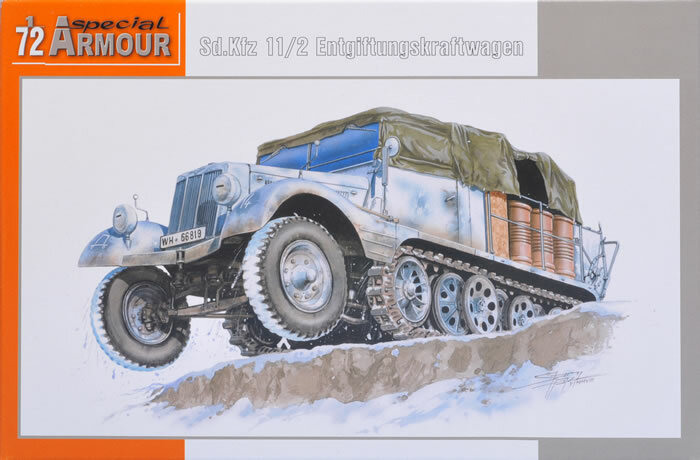 The first, the Sd.Kfz.11 (Basic Vehicle), was reviewed by me back in November 2006 and the second, Sd.Kfz.11 Nebelkraftwagon, was reviewed by Rob Baumgartner in June last year. Although it is not mentioned on the box, and according to my main reference, Nut & Bolts No. 20, the second offering is an Sd.Kfz.11/4 which was built as a Smoke Generation Vehicle. Its rear body was significantly wider than those before with a longer ammunition locker, seating for only four crew (most could accommodate six) and doors to the crew rear access. This third offering then is the Sd.Kfz.11/2 Entgiftungskraftwagon or Decontamination Vehicle but again, according to Nuts & Bolts, they were never used in that way, instead being used as ammunition carriers or just general transport. Immediately behind the driving compartment is a tall stowage bin for rubber chemical resistant suites for the crew and such, a flat bed tray which could carry 12 drums of chemical (only 8 supplied in the kit) and at the rear, a spreading device. 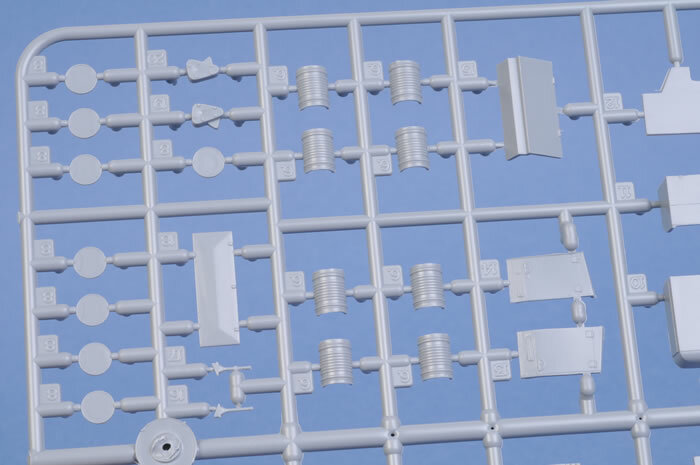 This is all given in the kit, on the second sprue and replaces the rear ammunition locker and crew position of the first two kits. 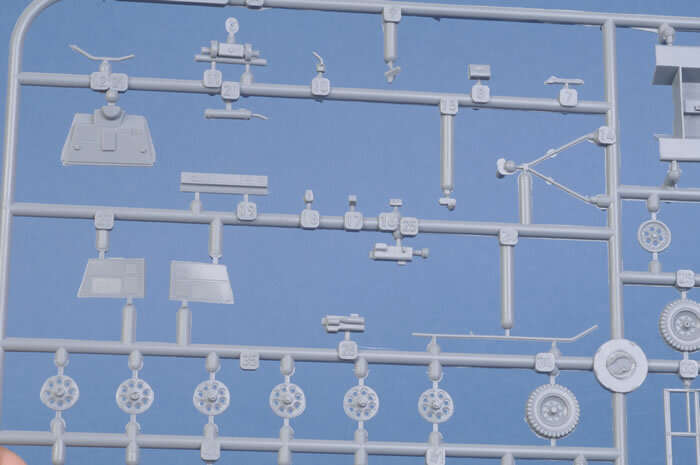 Since reviewing the first kit in 2006, I've started to build it and found a few more problems that I wasn't aware of before, apart from the flash and rubber band tracks and as all three kits share the main sprue, these problems will exist in all of them. Firstly, the mould halves don't match up. For the bigger parts where there is only detail on one side it's not a problem but for things like road wheels, steering wheel, front axle, front tyres etc, there will be a lot of cleaning up to do just to get them to fit and some of the smaller parts are almost, but not quite, unusable. The front radiator and grill are not quite tall enough and had to have a piece of card glued under it to raise it up. Its also missing a filler cap. The way the outer most road wheels mount on the inner ones looks very fragile and I feel will cause problems unless a lot of time is given for the glue to harden up. On the front guards (fenders), just behind the rubber tyred steering road wheels, there are three horizontal ridges which are very prominent on the box art, instructions and photos but are missing on the plastic. The only prominent inaccuracy I could find in this particular mark of the Sd.Kfz.11 was the side rails which keep the chemical drums on the flat bed. 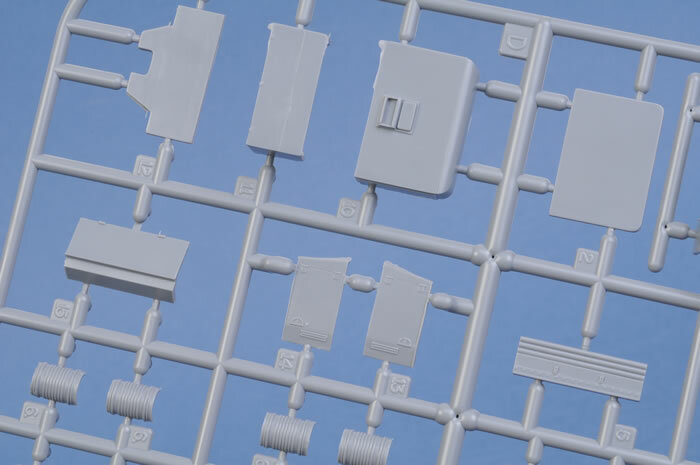 Having four uprights, they don't match the photos in my reference and look like those from an earlier model which was not built in large numbers. Having given the original a thumbs-up when I reviewed it, I must admit to being some what disappointed by these kits especially as I'm a fan of MPM's later aircraft models. 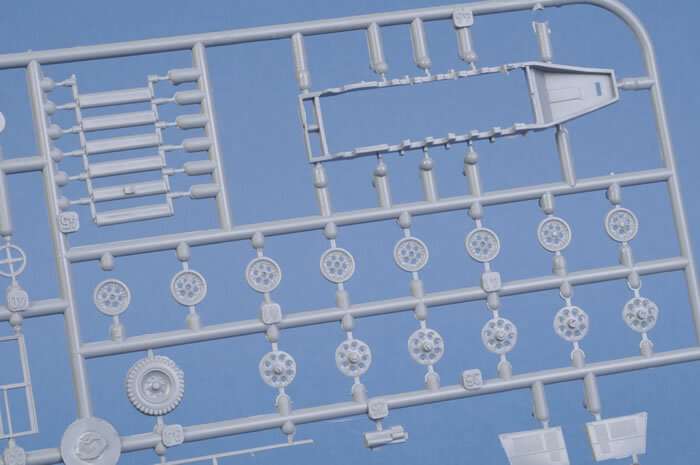 Nevertheless, I believe, with sufficient work and care, these could still be the basis of a top class model.